Adams Carpet Care is proud to offer oriental and area rug cleaning in Raleigh, Cary, Durham & Chapel Hill. Customers from around the Triangle have consistently chosen Adams to service their oriental and area rug cleaning needs since 1985. Adams is a trusted source because of the attention to detail, environmentally safe & biodegradable products, certified technicians and the 30 day warranty that is provided on each and every job. Area rugs add an important element to your office or home décor and having them professionally cleaned is a must. These rugs are placed in high traffic areas, where pets and kids frequent or where they are susceptible to spills and stains. We recommend having your area and oriental rugs cleaned annually, especially if there are pets in the home. Annual cleanings also remove dirt and allergens from your home. 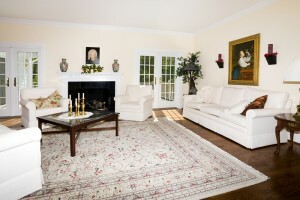 This annual cleaning helps to restore and maintain the original condition of area rugs. Adams Carpet Care provides the same level of quality we would expect in our own office or home! We will provide you with a free estimate and schedule your job promptly. In the majority of cases, the area rugs are on hardwood floors, so we will take the rug away and return the clean rug in approximately 10 days. For some customers, this is not an option or based on preference, you may want to have the rug cleaned on site. Our Raleigh oriental and area rug cleaning process utilizes a truck-mounted steam extraction method that eliminates dirt and spots and stains. Processes may include vacuum, chemical clean and/or steam extraction. After the cleaning, you can walk on the rug immediately! We recommend waiting 24 hour before replacing furniture on the rug. When you are ready to find out what customers around Raleigh have known for over 28 years, contact us to schedule our free estimate. If you are in need of Upholstery or Furniture Cleaning Click Here.